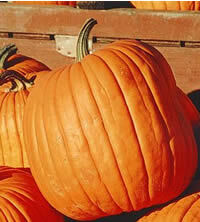 If you are like most people, pumpkin is something you think of come the holiday season (pumpkin pie anyone?) as well as a rather large and strange fruit that you cut up with a knife to scare little kids with. Yet...what about pumpkin and tea? At first blush, that probably doesn't sound too good, does it? Truthfully, when I had my first pumpkin tea I was bracing for "the worse." Yet, I had a happy surprise. Granted, a pumpkin tea is WAY out of the ordinary. If you want a traditional tea taste in your tea, best to stay away from something with pumpkin in it. On the other hand, if you want something out of the ordinary and feel experimental, a pumpkin tea just might hit the spot from time to time. Listed on this page are links to teas that I classify as having, or at least should have, a "pumpkin taste."